Star Wars fandom proposes some problems for girls. The majority of characters are male of course, but more importantly just about all official licensed merchandising is geared towards boys. (Marketing people at Disney, take note, there is a vast untapped market here!) Having a daughter who likes Star Wars, AND pink girly things, can create a bit of a challenge when it comes to Star Wars costumes. But being a firm believer in creative liberties, and personal expressions – as well as being the owner of a several cans of pink spray paint, we went to work. 10 minutes of work, and wait time about the time it took to watch 3 Clone Wars episodes, we had the perfect Pink Vader costume. Using blue painters tape, cover any parts of the mask you do not want painted. Prime with grey spray paint. Watch 1 Clone Wars episode while primer dries. Spray with pink spray paint. Watch another Clone Wars episode while the pink dries. Spray again with pink spray paint, if needed. Watch a bonus Clone Wars episode while the pink dries completely. After entirely dry, remove the blue tape, and voila, a Vader mask any girl would be happy to don. We did not prime the mask first. I highly recommend that you do though, it’ll cover better and the color will be more even. The lightsaber boppers were made by Jedi Master Heidi. We will have instructions on how to make those in a later post. 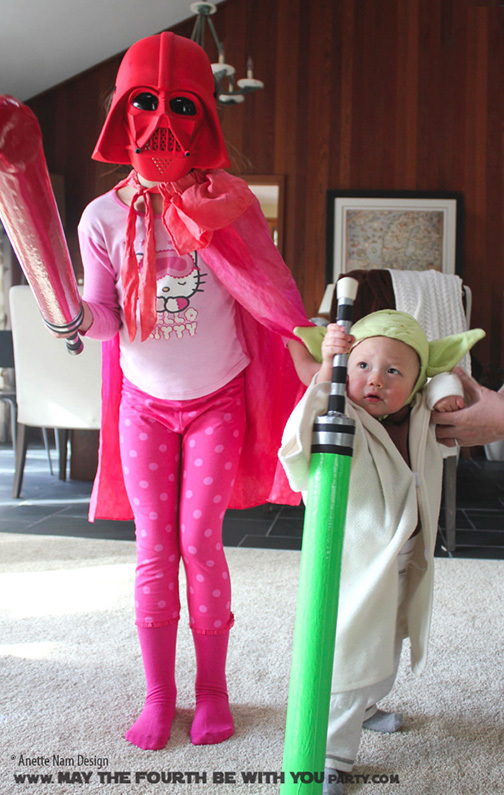 Read our post about the Yoda costume here!